If everything goes to plan we'll be moving into our new home in the next couple of months and we're so excited, I've been spending hours on Pinterest searching for inspiration and planning how I will decorate our new house once we've moved in and today I'm sharing my bathroom inspiration with you. First up is the gorgeous vanity unit from Bella Bathrooms, I'm obsessed with grey at the moment and I think this unit would look great in our family bathroom plus it has a good size cupboard underneath for all of my beauty products. For more stunning vanity units click here. I like these Ikat border towels from Asda, the colour would match the vanity unit perfectly and the Ikat design looks really contemporary and cool plus they're a bargain at just £6. I'm in love with the Belice LED Mirror from Pebble Grey, it looks really sophisticated with the LED lights, the mirror is steam free, it has a handy shelf and a shaver socket which will make life much easier for my husband, I think it will be a beautiful feature in our bathroom. 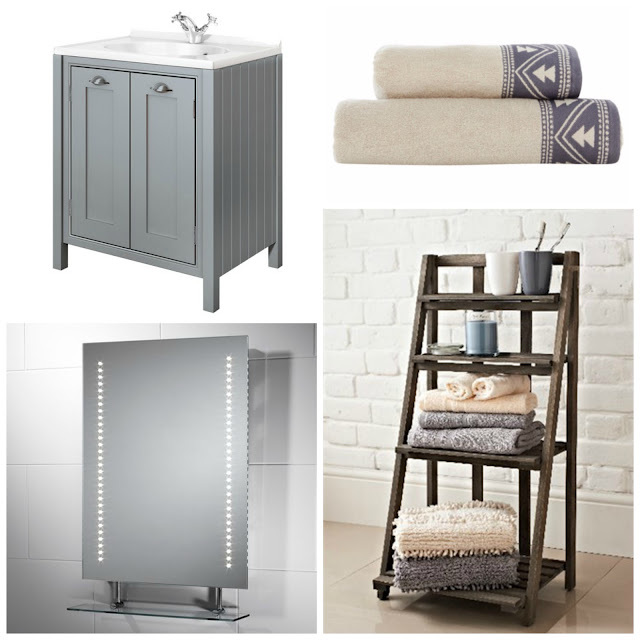 Lastly I love the Slatted Bathroom Shelving Ladder Unit from Matalan, it's so handy to store towels on and is also nice for putting little decorative items on to give the room more personality. Let me know what you think of my choices, which item is your favourite?